Investor sentiment is terrible. That's a good indicator stocks will do well in the intermediate term unless the fundamentals crater. About 50% of retail investors think the stock market will be lower in the next 6 months. Even though some bears claim investors are always buying the dip because they have been trained to do so in this bull market, retail investors are actually nervous. 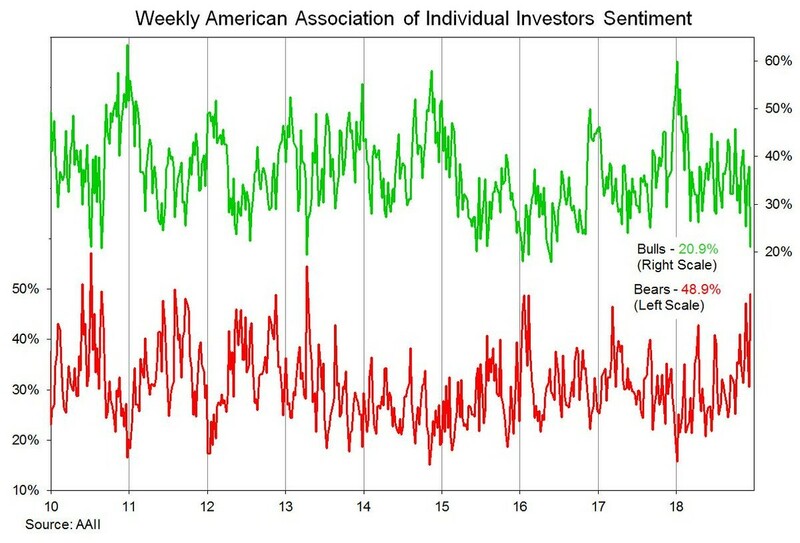 Bears don’t want retail investors to be nervous because that’s a bullish indicator. The reading of retail investors expecting a decline in the next 6 months is the highest since April 11th, 2013. Bears - Last time sentiment was this suppressed, the market rallied 16% into the end of the year. As you can see from the chart below, the AAII survey shows 20.9% of investors are bullish and 48.9% are bearish. The percentage of bulls is above the 2016 low, but the percentage of bears is the highest since 2013. Investors are panicking about a recession even though there isn’t one coming in the next 6 months. This makes some believe there could be a final rally in this bull market. Personally, I’m much more confident that there won’t be a recession in the next 6 months, than I am that there will be a recession in 2020. If there is a recession in the next 1-2 years, it will be the most anticipated recession ever. However, just because everyone is following the yield curve flattening doesn’t mean it won’t be correct. An inversion may encourage a recession. Investors will sell, and banks will tighten their lending standards. Many investors been excited about the November CPI report ever since oil cratered. We knew it would be great for real wage growth which will help retail sales this holiday shopping season. However, in terms of Fed policy, this report didn’t change anything because core CPI was strong. Let’s get into the details. I think the selloff has more to do with the concerns over trade wars and the global economy more than the Fed's actions. This is just that, a selloff at this point, not a bear market as many are hinting at.